There is a shop not far from me, in West Ealing, called the Cudi Food Centre. It sells all manner of foodie goods from Asia, the Middle East and Europe and it’s where I go if I’m looking for something unusual. They also have a good range of fresh fruit and veg and is a great alternative to the local Sainsbury’s. They had an enormous box of fresh beetroot in last week, so I picked up three of those with the intention of making a deliciously healthy feta, orange and beetroot salad that I made once before. However my good intentions went out of the window when I remembered the recipe I had seen for chocolate, hazlenut and beetroot brownies. 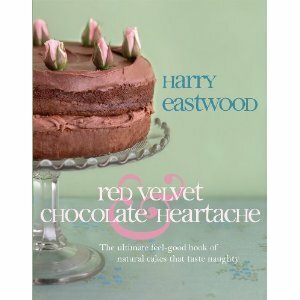 The recipe (Forbidden Chocolate Brownies) is from Harry Eastwood’s book ‘Red Velvet and Chocolate Heartache’. This is a beautiful book, with lots of lovely pictures and some very tempting recipes. However I must admit that I find the prose a little irritating at times. There is a rather flowery introduction to each cake in which Harry describes the character of the cake (Victoria Sponge is ‘young and shy, with a perfectly ironed apron’), which I’m sure will seem charming to some, but is not my cup of tea. The unusual thing about this book is that almost every recipe uses some sort of vegetable as one of the main ingredients, including courgettes, aubergines and potatoes. Many of the cakes have a very low fat content, and the majority of them appear to be gluten free. When I baked the brownies I did make some amendments to the recipe so these pictures show my slightly adapted version of it. I swapped about a third of the dark chocolate for milk chocolate (to use up some Easter eggs), and 3 tbsp of the cocoa powder for plain flour, just because 70g seemed rather a lot. The result was an absolutely delicious batch of brownies. They were a beautiful colour, with just a hint of the beetroot red showing through, very chocolately and extremely moist. I will certainly be making these again, and will be picking out some more recipes to try from this very unusual and lovely book. I am sending these over to Ros from the More Than Occasional Baker for the monthly Alphabakes challenge that she hosts with Caroline Makes. 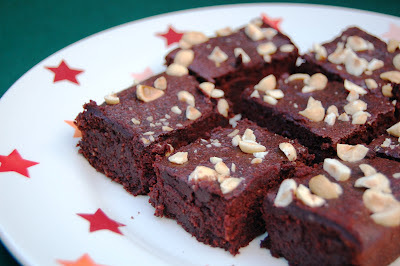 This month the letter is ‘b’ and My Blooming Beautiful Beetroot Brownies fit the bill! These look really good – moist and fudgy and delicious. They also look heaps better than the beetroot brownies I had a go at making a couple of years ago. Lovely brownies Lucy. This book hadn't hit my radar, but I like the sound of using veggies and unusual ingredients in cake so I make have a little peek next time I'm in the bookshop. Great colour and a delicious idea. Oh my goodness – i LOVE this book. Beetroot is great in chocolate things. I had a good recipe from a Good Food mag for choc brownies not so long back too. I haven't done the brownies but did do Beetroot fudge. I found it a bit runny and ended up making truffles with the mixture instead.